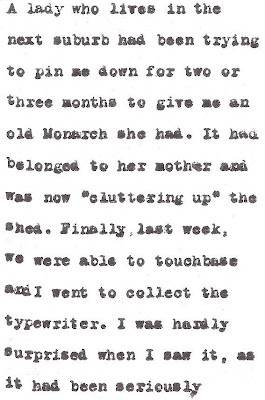 oz.Typewriter: The Emperor's New Clothes: A Monarch Typewriter Stripped Naked! The Emperor's New Clothes: A Monarch Typewriter Stripped Naked! "A child, however, who had no important job and could only see things as his eyes showed them to him, went up to the carriage.
" 'The Emperor is naked,' he said. The Monarch's serial number is MH50386. I'm not sure what the letters "MH" represent, but the number suggests it was made more than 100 years ago, in 1910 or 1911. It was made at Syracuse in New York. Apparently Remington took over making the Monarch in 1915. I've still got a little bit of work to do on polishing it up. I'm not entirely happy with the decals and will probably have another "go" at them. I will replace the coloured rings in the centre of the ribbon spools, which can be seen below. For the typecast, I used the ribbon which was still in the typewriter. I "bathed" it in WD40, ran it through paper towels and then rewound it. I like it. will it rust, do you think? I like it, too. Great type-action movie! 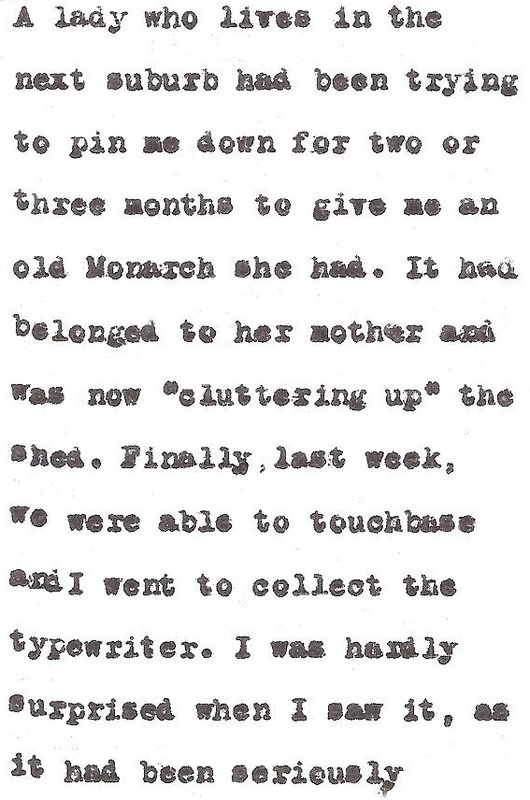 The Monarch does have a wooden type-feel to it, doesn't it? Still, a dignified machine. Looks great! Maybe I should do a silver-surfer, too. Robert, looks like you did a great job on the stripping, especially around the decals - how did you manage that? On the Underwood I stripped (a Spring chicken in comparison) the rich golden transfers were on top of the black gloss coat, but under a layer of clear lacquer. Try photographing it high key - overexposed by a couple of stops - you'll be amazed by the shine and detail that comes out of the reflective surfaces. A Happy Typewriting Christmas to Everyone! Hitting the Wrong Typewriter Keys? Hunter S on a Nakajima Typewriter? A Rum Idea! 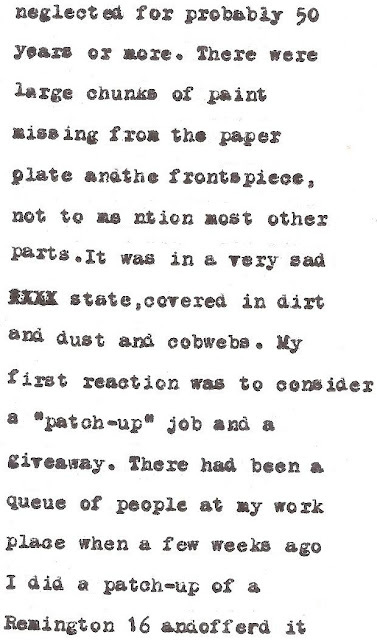 Salter Ousts 2700 British Government Typewriters!